Guana Palms is a 14"x20" watercolor on 140 lb. Arches cold pressed paper, of the most beautiful Guana State Preserve. ( See the "Wall Preview" option below to select your room type, size preference and wall color to get a better view relative to the art ). Guana Palms is about one of the most beautiful Guana State Preserve. Old "Florida as paradise" is emboddied here, as if it might have ancient creatures and no people roaming around, I often imagine dinosaurs! (See the "Wall Preview" option below to select your room type, size preference and wall color to get a better view relative to the art). Guana Palms is a contemporary 14" X 20" watercolor on 140 lb. Arches cold pressed paper. (I recommend printing on Fine Art Paper. See the "Wall Preview" option below the print size tab, then explore your designer wall color with the art). 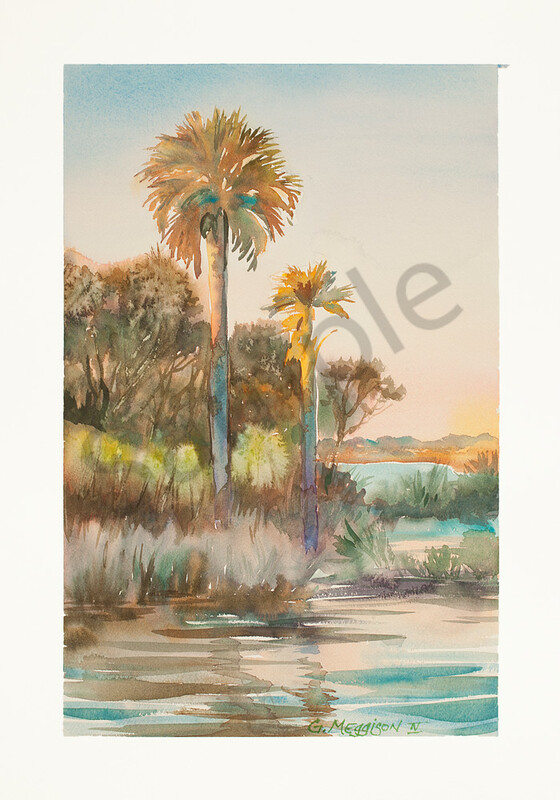 Guana Palms is a watercolor of the most beautiful Guana State Preserve. Old "Florida as paradise" is emboddied here, as if it might have ancient creatures and no people roaming around. (I recommend printing on Fine Art Paper. See the "Wall Preview" option below the print size tab, then explore your designer wall color with the art).